A scheduler is also available, allowing you to record your favourite shows directly onto the disk when you can't watch them live. While PowerCinema's TV mode is no replacement for a hardware PVR box like a TiVo, it is easier to use than most other software implementations of this feature. 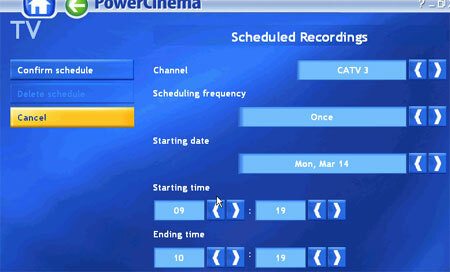 Unfortunately, we had three issues with the Cyberlink PowerCinema software, one minor and two major. The minor issue was the programs occasional sluggishness. Certain screen transitions and button presses took far longer than they should have, it seemed, and this made selecting options quite frustrating sometimes. Not a big deal though. What was a big deal was the fact that our audio (received over coaxial cable from a satellite TV decoder, then pumped through a Creative Audigy card) would often be reduced to painful blasts of static when we opened the TV viewing (PVR) application within PowerCinema. This seemed to happen with no rhyme or reason. One time the signal would be fine, and the next time we tried the screen it would be hopelessly distorted. Generally, closing and reopening PowerCinema solved this, but it remained an irritating problem. The second extremely frustrating issue we had with this software was the fact that PowerCinema will only save captured video to your 'my videos' folder in 'my documents'. The option exists to change this folder in the interface, but it gave us no choices; we were unable to change the save location despite having an entire 80GB drive reserved for the purpose of testing video capture! This seems more like a bug than anything else, but we were unable to find any relevant updates from Cyberlink. Grrr. While we had some misgivings about the remote ahead of time, it proved itself well in use. The range was more than adequate and the buttons worked precisely. A little more control over navigation would have been nice, as we found we had to resort to the mouse for certain actions like taking snapshots, but on the whole we found the Cyberlink remote control a pleasure to use and an enhancement to the Powercolor Theatre 550 Pro bundle.